James Main is living the dream. Or perhaps it’s more accurate to say that James Main is living MY dream. He’s a small-business owner, first-time homeowner, husband, and soon-to-be father who still has time to perform with his band, Brother Shamus, in venues in the D.C. area and on the East Coast. Main’s modest and comfortable lifestyle in South Arlington, Va., is the result of more than 20 years of toiling in kitchens, working up the ranks from dishwasher to executive chef and now at the helm of Main Course Personal Chef Service. “The first job I had was at a sub shop,” Main said. “I moved in ’89 to Cape Cod, and that was the first time I worked in a real restaurant. It was called the Lobster Boat, nothing fancy.” Main said that he knew almost nothing about working at a restaurant when he came to the Cape – in fact, he said he was so bad his first day on the job that he was sent home – but “as the summer progressed, I got better. I worked there seven seasons.” Main attended culinary school in Boston and used summers to work at the Lobster Boat. Main is a long way from the Lobster Boat. After moving to D.C. in 1997, he spent the next several years in kitchens such as D.C.’s Café Saint-Ex and Clarendon’s IOTA Club & Café. Main then decided to go into business for himself as a personal chef. For a lot of clients, he goes to the grocery store, and he goes early in the morning. “I shop, cook, package and freeze the same day. One question I ask clients is for guidelines to follow when preparing meals. Some ask for farm market sources,” and for those clients, Main gets as much as he can from local farmers, mainly fruits and vegetables. So spill it, Main, where do you shop? “Farm markets are great for produce, and also for some meats and event goat cheese.” He also goes to Let’s Meat on the Avenue in Alexandria, Va., the Organic Butcher of McLean, Whole Foods, Wegmans, and other local butchers. Because Main cooks in a commercial kitchen and his clients’ home kitchens, he can easily accommodate requests for recipe modification due to allergies or other restrictions. Meal plans of 20 or 30 are available, with dishes such as Chicken Parmesan with pasta – a favorite of kids and adults – and Taj Mahal Chicken, a slow-cooked dish with onions, sweet mango chutney and cider vinegar. He also does small private dinners, and has been learning more about wine pairings to accommodate clients. During our conversation, Main brought out a delicious treat – a ¾-pound piece of Brie wrapped in puff pastry, brushed with egg wash and baked at 375 for 30-35 minutes. He served it with an onion relish of sweet onions caramelized with light brown sugar. The creamy, flaky Brie was an impressive-looking treat, and I was surprised at how easy it is to make at home. Main sent me home with a couple of custom barbecue seasonings, a dry rub and secret barbecue sauce (more on those in another column), a pink-red Hawaiian salt and smoked salt. Utilizing flavored salts is a great way to give a dish a little something extra. 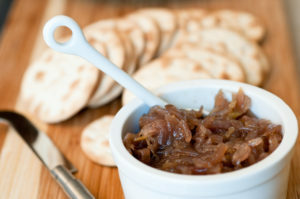 Try marinating a steak with olive oil and smoked salt and serving it with the Brie and caramelized onion relish. "Main Course Personal Chef Service"
everyfoodfits.com » Shrimp + Asparagus = Healthy & Healthier!